Having the suite and breakfast is a plus , also the refrigerator. Easy, friendly, clean, pleasant surroundings. Clean, free parking or valet, complimentary full breakfast. This hotel is good if you have low expectations and are not looking for luxury. It's not the kind of hotel that one lounges in for the day. The location and spacious room. Room was a bit shabby and noisy from traffic outside. 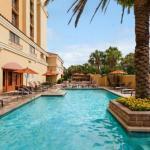 The 244 all-suites Embassy Suites Hotel Orlando International Drive South is one mile from the Orange County Convention Center and provides top quality accommodation for the upmarket business and leisure traveler. The hotel, which has an atrium with a waterfall, provides a free shuttle to all of the major theme parks. Other items included with the room rate are a cooked-to-order breakfast, a managers evening reception, high-speed Internet access, local telephone calls, a copy of USA Today and self-parking. There are eight meeting rooms available for social or business functions. The largest can accommodate 500 guests. Area landmarks and attractions include numerous golf courses, Walt Disney World, Sea World, the Wet 'n Wild water park, Universal Studios, the Islands of Adventure amusement park, Gatorland, the Florida Citrus Bowl, Amway Arena, home of the Orlando Magic basketball team and shopping at the Prime Outlet Shopping Mall, Fashion Square Mall and the Florida Mall. The two-room suites have a seating area with sofa, dining room table and chairs, two 32-inch flat screen televisions with cable news and movie channels, on-demand movies, work desk with ergonomic chair and high-speed Internet access, alarm clock radio, kitchen area with refrigerator, microwave oven and coffeemaker, two two-line telephones with voicemail and speakerphone, iron and ironing board and a hairdryer. This hotel has an outdoor swimming pool, fitness center and a video arcade. There is a coin-operated laundry on site, ATM, convenience store and a gift shop. The business center is open 24/7 and the front desk has safe deposit boxes and information on area events and attractions. The hotels Fisheye Grill serves lunch and dinner and room service is available from 11am until 11pm. Places to eat nearby include a Bahama Breeze, Olive Garden, Vitos Chop House and the Capital Grille. Visitors to Orlando who stayed at this Embassy Suites use the words fantastic, wonderful and impressive to describe their stay. The suites are spacious, well equipped and many clients appreciated the great service they received from the professional team of employees. The location was good, on the International Drive tourist strip and not too far from Disney and Universal Studios. Most guests said the breakfast was excellent as were the free drinks at the managers reception every evening. Parking: Yes, there is parking. There is no charge for self-parking. Valet parking costs $10 per day.